When Is It OK To Hack? 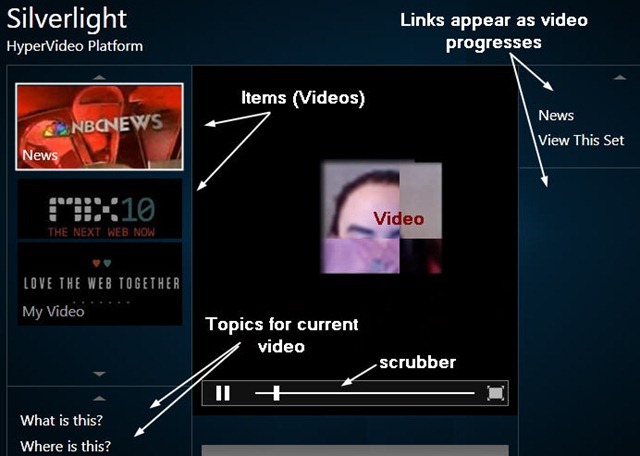 One of the goals of the Silverlight HyperVideo Project is to demonstrate best practices. So when is it okay to throw in a quick hack to get things working? Case in point: as I approached the release this week for the latest alpha, I noted that the player was not updating when the user clicked on a topic, though the links were appearing as if the player had been advanced. To make the issue clear, in this image you see a cut down version of the player. Each item (video) has its own set of topics and links. The topics are shown as soon as the video starts, the links appear as the video plays. If the user clicks on a topic (lower left) what should happen is that the video (middle) jumps to that topic and the scrubber (below the video) should advance to indicate where in the video the topic begins, relative to the start of the video. Checking the source code for the SMF (available here) we found that Position is a dependency property and was not responding to the Binding as we expected. Since the folks at Vertigo owned that code and were convinced they could fix this in the next release, I opted to take their change an copy it into my project. To encapsulate the hack, however, I created the HVPCoreMediaElement, derived from the CoreSmoothStreamingMediaElement. And all was right with the world. This was minimally intrusive, and I was very pleased with it. I should have known. The problem, of course, is that now that I’m binding the new PositionOverride I’m reading wonderfully, but writing, not so. There are a lot of ways to fix this, but the easiest, fastest and perhaps ugliest is to add a second binding. After all, binding to Position was working great for setting, and PositionOverride is now working great for reading. 'need both the getter and the setter. This entry was posted in Patterns & Skills and tagged Mini-Tutorial, Patterns. Bookmark the permalink. 7 Responses to When Is It OK To Hack?